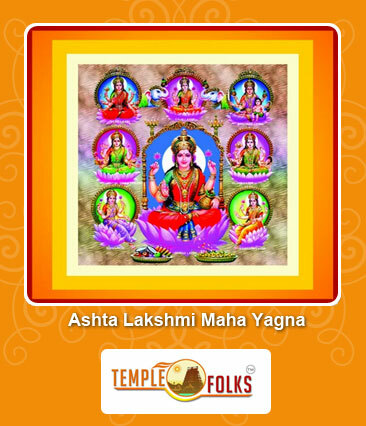 Ashta Lakshmi Maha Yagna - Eight form of Goddess Lakshmi and their Goodness at Once! Each of these eight forms of Goddess Lakshmi is the ruler deity of various form of Wealth such as Materials, Money, Grains, Luck, Progeny, Courage, Victory and Knowledge. What is exactly Ashta Lakshmi Maha Yagna? Ashta Lakshmi Maha Yagya is performed with the aim of invoking Eight Divine aspects of Goddess Lakshmi to achieve eight different form of wealth through this maha fire ritual. This Maha havan goes for two days the first day is full of Japa and the next day will be homam for eight goddess of Lakshmi. Benefits and Significance of Ashta Lakshmi Maha Yagna: Each goddess has their own individuality and the common benefit of performing this Ashta Lakshmi Maha homam is that for gaining various forms of wealth and prosperity to live a happy life ever. 1. Adi Lakshmi: Goddess Adi Lakshmi Portrayed the appearance of Lakshmi which lives with Lord Vishnu in the Vaikuntha, She blesses her devotees with all riches. 2. Dhana Lakshmi: Goddess Dhana Lakshmi helps her devotees for earning income in multiple right ways by fulfilling their desires. 3. Dhanya Lakshmi: Goddess Dhanya Lakshmi is the giver of all related to agriculture needs. She blesses her devotees with wealthy and healthy food in their life. 4. Gaja Lakshmi: Goddess Gaja Lakshmi brings all lucks in every phase in life. 5. Santhana Lakshmi: Goddess Sri Santhana Lakshmi bestows her devotees with the greater wealth of child. 6. Dhairya Lakshmi: Goddess Dhairya Lakshmi grants her devotees with the courage and strength to defeat any sorts of struggles. 7. Vijaya Lakshmi: Goddess Vijaya Lakshmi helps her devotees to attain victory in all aspects of life. 8. Vidya Lakshmi: Goddess Vidya Lakshmi grants her devotees to explore and grow their talents. How to organize Ashta Lakshmi Maha homam? To conduct Ashta Lakshmi Maha homam, one should seek support from a leading Vedic firm for obtaining optimum results. Vedic folks is a reputed Vedic consulting company which helps to organize the homam with powerful mantras and fire rituals. 24/7 online support is available for those who want to book the homam in advance. Live T V shows are also offered for watching the homam from anywhere.